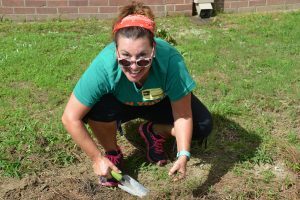 NEW ORLEANS – Recent flash flooding made a mess of the Edible Schoolyard New Orleans’ garden at Phillis Wheatley Community School in Treme, prompting staff members of Farm & Table NOLA, Centerplate, and Erika Nolan of Instar Farm, to step up to the garden to assist with re-planting. Eight staff members re-landscaped the flower gardens at the school’s entrance with fall bedding plants and edibles, and also painted a fence in the school’s edible herb garden. For those interested in learning more about edible gardening, Erika Nolan of Instar Farm will present a FREE class titled “Grow Your Own Edible Garden” September 9 at 1:00 p.m. at the Farm & Table JAMBOREE, a free festival offering food and music, tastings, interactive displays, hands-on workshops, cooking demos, games, Kid Zone programming, and more. For the full schedule of Jamboree events, visit http://farmandtablenola.com/festival/schedule/. 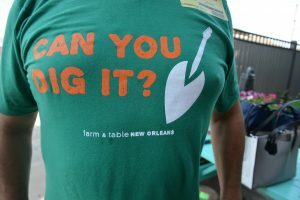 Farm & Table NOLA will also host the Farm & Table Experience (September 8), a gathering to discuss the cultivation, distribution, and consumption of food and drink sourced locally. Idea exchanges and educational discussions will focus on the future of food. Also on September 8, Farm & Table NOLA will hold the 3rd annual Chefs Taste Challenge, a cooking competition aimed at broadening awareness for the use of fresh, healthy and sustainable ingredients. Ten Southern chefs will compete for the grand prize by preparing their best farm-to-table dishes utilizing fresh, in-season ingredients. Edible Schoolyard New Orleans (ESYNOLA) is a comprehensive seed-to-table food education program that aims to change the way children eat, learn, and live at FirstLine public charter schools. The program offers hands-on gardening and kitchen classes that are integrated into the curriculum, culture, and cafeteria programs at the schools it serves. Founded in 2006, ESYNOLA serves 2,800 students in grades pre-K through 8th grade across the FirstLine Schools network. The mission of FirstLine Schools is to create and inspire great open enrollment public schools in New Orleans. FirstLine currently operates Samuel J. Green Charter School, Arthur Ashe Charter School, Phillis Wheatley Community School, Langston Hughes Academy, and Joseph S. Clark Preparatory High School. Farm & Table NOLA will take place September 8-9, 2017 at the New Orleans Ernest N. Morial Convention Center. 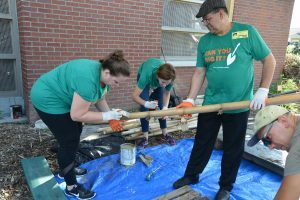 Farm & Table NOLA staff members paint poles for a new garden fence at Phillis Wheatley Community School. Farm & Table NOLA Director Katie Calabrese re-plants fall bedding at Phillis Wheatley Community School.